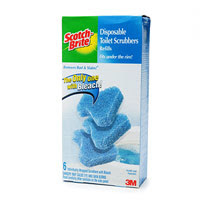 Click here to print a coupon for a Free Scotch-Brite Disposable Toilet Brush Scrubber !!! Because this is a PDF, you can print as many of these as you need. I picked up one of these at Stop and Shop for $5.29 and one at Big Y for $5.19. I have yet to see them at CVS or Rite Aid. Note: They can only be redeemed for up to $4.99, so if they are priced at $5.29, you will pay the 30 cent difference. Sounds good to me!!! Click here for coupons for other Scotch-Brite products.